The Coupon Promotions feature is an automatic discount is applied once trip conditions are met; however, instead of discounting the current sale, a coupon is printed at the end of the sale and can be used to provide a discount for a future sale, giving customers a good reason shop with you again soon. To create multiple Coupon Promotions, with the ability for a sale to produce multiple coupons. To choose Print Only or Serialized Tracking coupons. To select simple or advanced printing options with the ability to print to specific network printers or a local receipt printer. To allow Serialized Coupons to be tracked in the Idealpos Database and recorded when printed and redeemed. Serialized Tracking Coupons cannot be redeemed more than once. To redeem a Print Only Coupon. You can type in the coupon promo code number to apply the discount within the sale. To redeem a Serialized Tracking Coupon. You can either scan the barcode or manually type in the coupon serial number to apply the discount within the sale. To have multiple text lines on the coupon with the option to choose large text and centred. To print one or more Graphical Logos stored within the receipt printer. To set a coupon validity date or number of days before expiry. 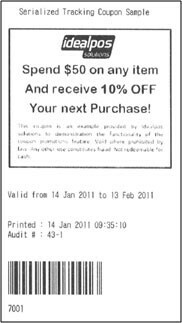 To print a coupon report on coupons that are outstanding and coupons that have been redeemed.